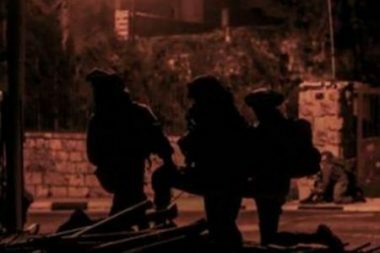 Undercover Israeli soldiers infiltrated, on Thursday evening, into the al-Mazra’a al-Gharbiyya village, north of the central West Bank city of Ramallah, shot thirteen Palestinians with live fire, and kidnapped one. Eyewitnesses said the undercover soldiers infiltrated into the village, before breaking into the home of a young Palestinian, identified as Tareq Rabea’, and abducted him. Rabea’ is the coordinator of the Islamic Block at Birzeit University. The abduction of the Palestinian led to clashes between the soldiers and many local youths; several army vehicles the invaded the village. The undercover forces fired dozens of rounds of live ammunition, wounding thirteen Palestinians, including one who suffered a serious injury, the Palestinian Red Crescent said. In addition, armed clashes also took place between resistance fighters and the soldiers after a number of military jeeps invaded the village from different directions. Furthermore, clashes took place near Birzeit University after dozens of soldiers gathered near its main entrance. The soldiers fired gas bombs and live rounds, while many students hurled stones and empty bottles on them.